On the 4th March 2014 shale gas company Cuadrilla (who have no current interest in exploration in Somerset) came to the Institute for Sustainable Energy and Environment at Bath University to give a talk entitled Why shale gas is key to economic revival and an environmental force for good although on the day it was called The Exploration for shale, why we’re doing this, why it’s safe and why it’s good. The speaker cited “the six big myths” of fracking including the possibility of fracking fluids and hydrocarbons contaminating ground water and illustrating the “reality” of fracking at 3km depth in the Bowland shale of the north of England but seemingly with no knowledge of the geology of Somerset or of the Bath Hot Springs and how they work – i.e. the migration of water from the Mendips to great depths where it is heated to reemerge under pressure at the surface via an unknown network of existing fractures. No need for fracking then in Somerset as the geology already has fluid migrating from depth to the surface via all the geological strata. There was no mention in the Cuadrilla myth list of the Royal Academy of Engineering’s main concerns on well failure and surface spillage – “Both are common to all oil and gas wells and extractive activities” (RAE), so that’s not a myth then. 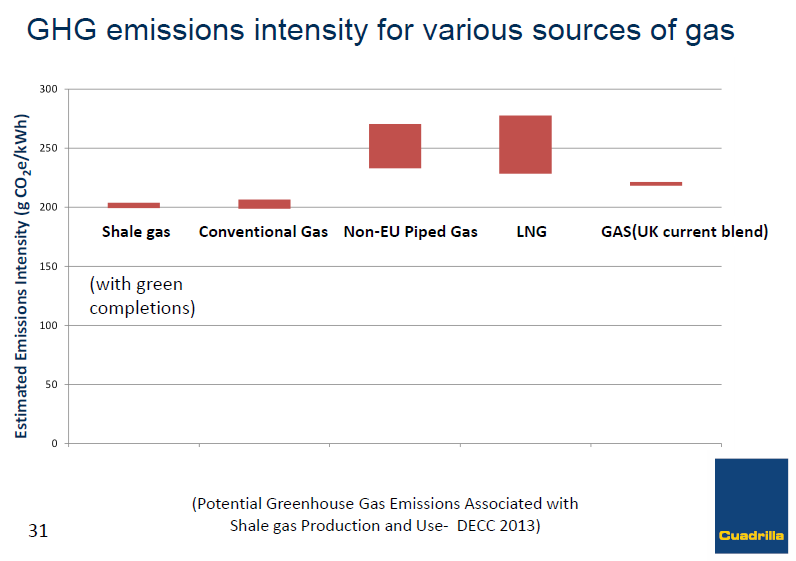 One slide directly compared how much gas is there in the Bowland shale with the UK annual gas consumption but without mentioning that only a fraction of the resource can be economically recovered or mentioning that the Houses of Parliament Office of Science & Technology says that “there are currently no official reserve estimates”. This post however is not about shale gas resources and reserves or about the complex Somerset geology, it is about Cuadrilla’s assertion that “continued gas consumption must be one of the key strategies in reducing CO2 emissions”. Cuadrilla’s message is basically that gas is less dirty than coal and that shale gas has brought down emissions in the USA – so wouldn’t it be great if the UK could do the same. 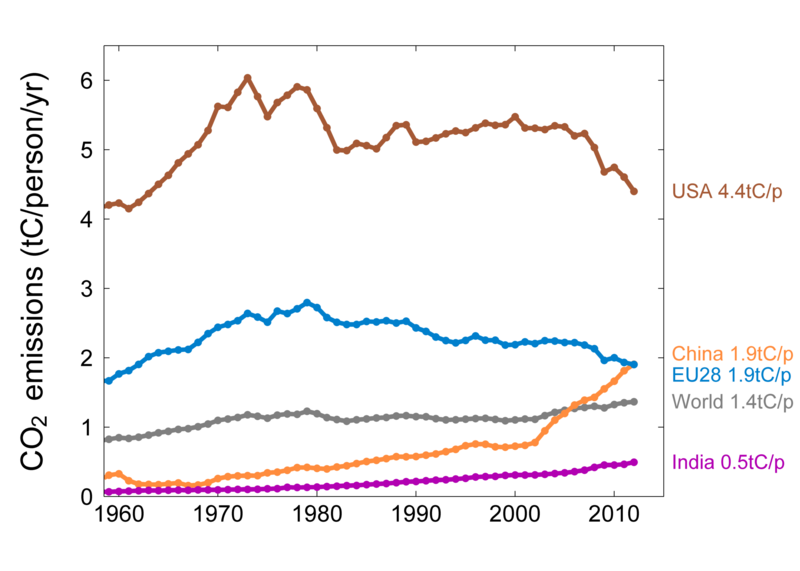 To illustrate this they compared the annual US natural gas production (EIA 2013) with the CO2 emissions of the top four emitters (Global Carbon Project). So increased US shale gas production results in reduced US CO2 emissions because methane generates less emissions per unit of energy than coal. But that is not the whole story. 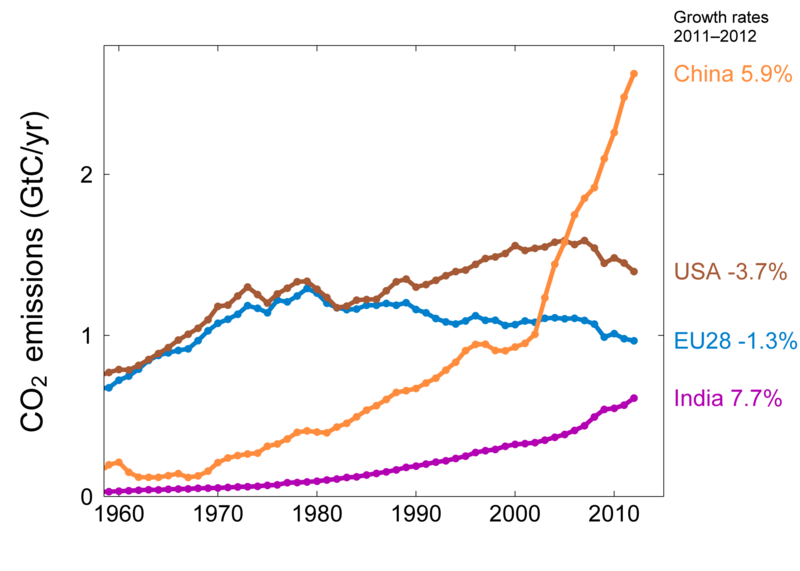 Caudrilla did NOT show the following slide, from the same source, which shows that whilst the per capita emissions in the USA are declining they are still more than double the per capita emissions in the European Union where emissions are also declining but without any shale gas. US emissions are about four times the world average. This highlights the fact that if the US concentrated on energy efficiency it could drastically reduce its per capita emissions. So if the USA is the number two CO2 emitter in the world and shale gas has had such an amazing impact on lowering US CO2 emissions then we might expect to see such good news as a reduction in global CO2 emissions? Do we? 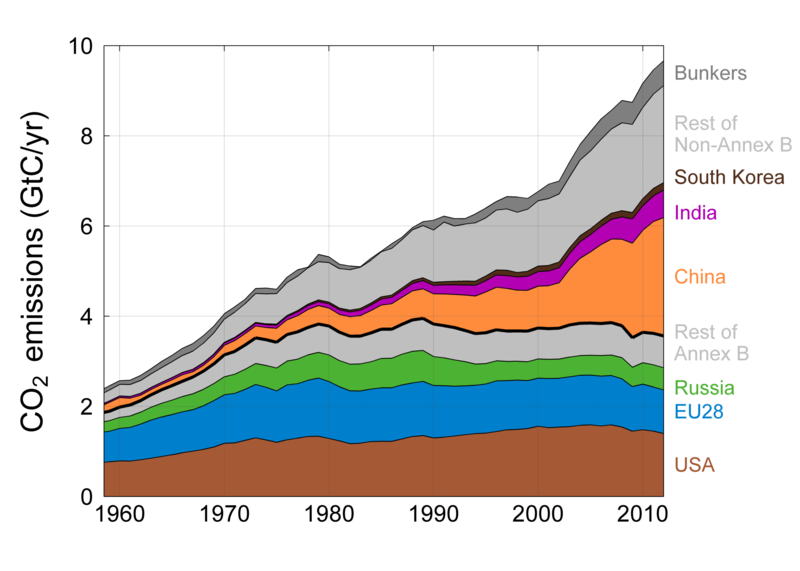 Emissions don’t go down they go up because the shale gas is additional to, not instead of, the existing fossil fuel production. 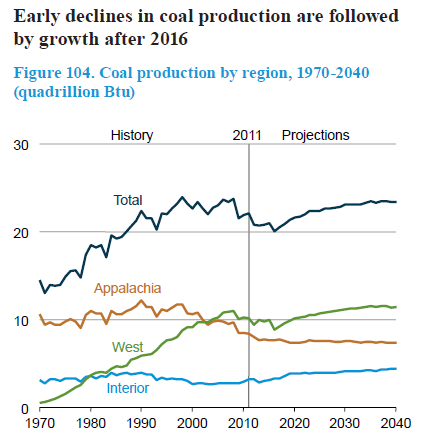 The IEA’s business as usual reference case for US coal production looks like this and shows a pickup in US coal production year on year after 2016 “as a result of growing coal exports and increasing use of coal in the electricity sector as electricity demand grows and natural gas prices rise” (EIA 2013). 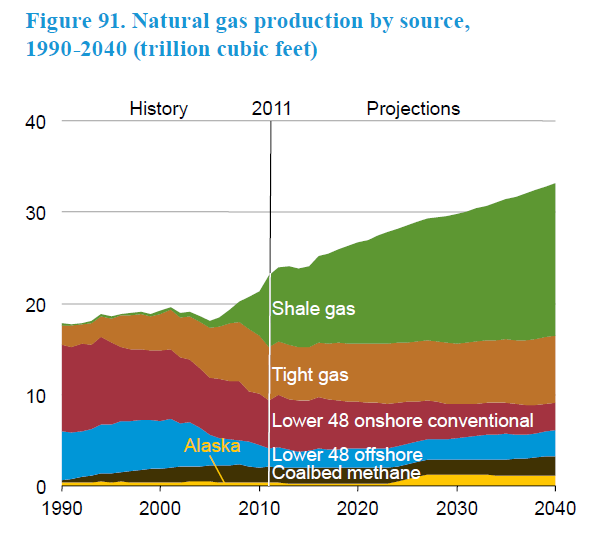 So, if US natural gas production is forecast to increase and so is coal after 2016 where is the CO2 benefit in the US coal for shale gas displacement equation? The Earth doesn’t care where the emissions come from (the USA, China, Europe, or wherever) it only cares what the global cumulative emissions are. Cuadrilla however reckon that they can capture 100% of gas through so called green completions so they have changed the DECC graphic to make it look like all shale gas might be subject to 100% gas recovery, not just by them but by everybody else as well. The Cuadrilla version was shown in their presentation with the words “with green completions” annotated in brackets. What evidence is there that Cuadrilla have ever achieved 100% gas recovery? They have never produced any gas so this is wishful thinking. The Tyndall Centre for Climate Change Research has also published a report on shale gas and climate change impacts, Shale gas: an updated assessment of environmental and climate change impacts, and say “any new sources of fossil fuel, even if relatively low carbon per unit of useful energy, are likely to be combusted and consequently add to the global emissions burden“. 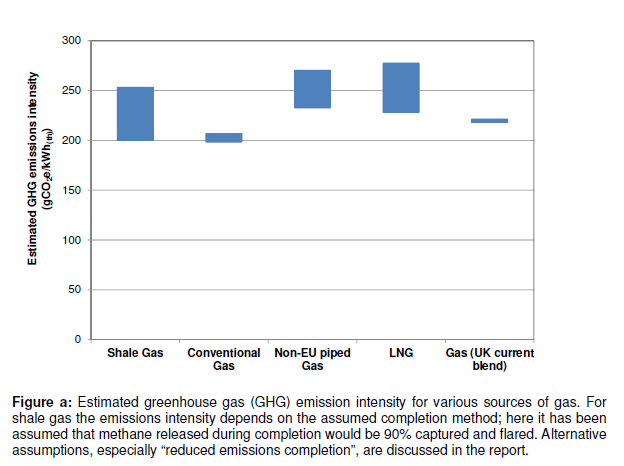 So, in summary, both the Tyndall Centre for Climate Change Research and DECC (McKay and Stone) say that in the absence of a binding global emissions agreement that shale gas will add to cumulative greenhouse gas emissions and contribute to further global warming, whereas Cuadrilla say that shale gas will reduce emissions on the assumption that it will displace coal. There is no binding global emissions agreement, so who is right? 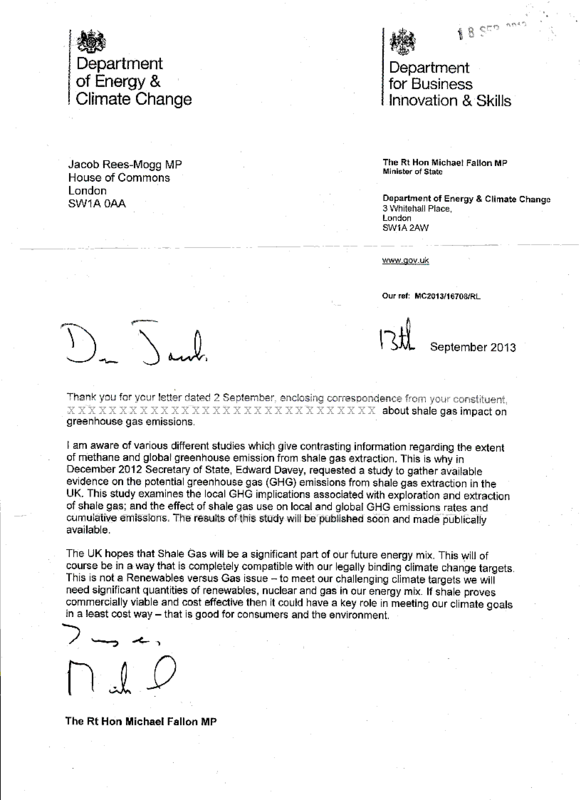 Who does the Rt Hon Michael Fallon (the responsible Minister) agree with – the Chief Scientific Advisor of his own department or the executives from a gas company with a vested interest in extracting the gas? It is worth noting that both the Tyndall Centre and the DECC report both say that UK shale gas will have virtually no impact on UK gas prices. “Good for consumers and the environment”? 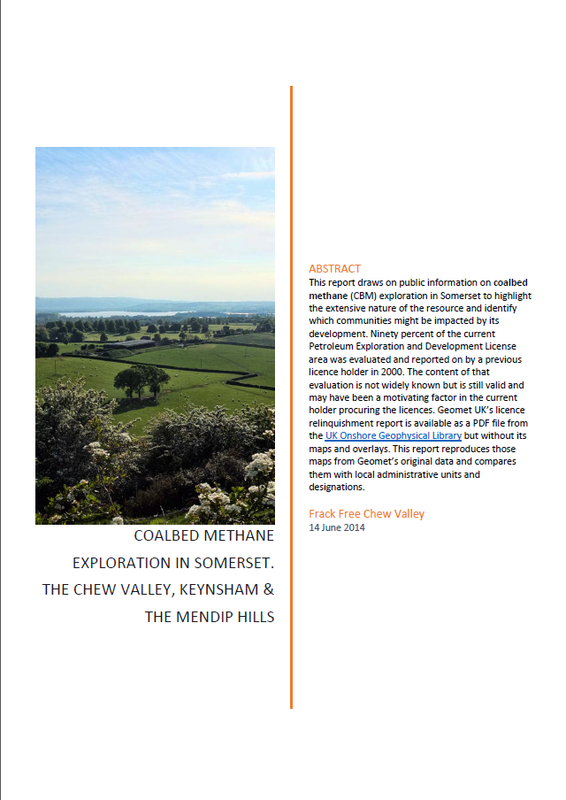 NB Caudrilla do not have any current interests in Somerset where the licence holders are UK Methane and Shale Energy PLC. UK Methane and Shale Energy plc have. Book a ticket for the Radford Mill Farm Frack Free Festival on Saturday 3rd and Sunday 4th May 2014, in the Cam Brook Valley.